With the new school year well under way, and the colors brightening our landscape, I am once again reminded of the importance to stop, slow down and breathe in the beauty of our world. Recently I was given a copy of Rachel Carson’s “The Sense of Wonder” (Thanks to Avery’s family). It is one of her final reflections on nature – based on the time she spent with her young nephew during his visits to her home in Maine. The essay is accompanied by beautiful photographic images. Coincidentally, soon after reading and reflecting on this book, I was sent Alice Hoffman’s “How to Find Happiness” list that includes such wisdom as “Walk a Dog” and “Look at the Stars”. As the days pass in my life, I regularly realize how fortunate I am to be surrounded by young children, who don’t need to be reminded of these life lessons. They don’t need to read a book or someone’s post cancer reflections. They are living it. They stop on the sidewalk to see the wiggling worm; they pick up the red leaf and hold it proudly in their hand as they walk into their classroom; they notice the acorn and the bird and the new weed flower. The patience and awareness that children have with their environment is a constant reminder and lesson for all of us here at CNS. We adults need to continually slow down our walk, stop with all the hurrying, and realize that at the end of the day, the difference of five minutes extra in the morning to be present with one’s child while they save the worm or pick up the leaf is precious. Time that must be appreciated – and not hurried. My children are growing up too fast. As a mother to four children, who now are almost all taller than I am – ranging in ages from 11 to 16, childhood has a fleeting sense of the temporary. What was once looking like a marathon, now more closely resembles a 5K. I have to seek out and create those moments now with my children. Remind them to slow down, to look up at the sky and to remember. 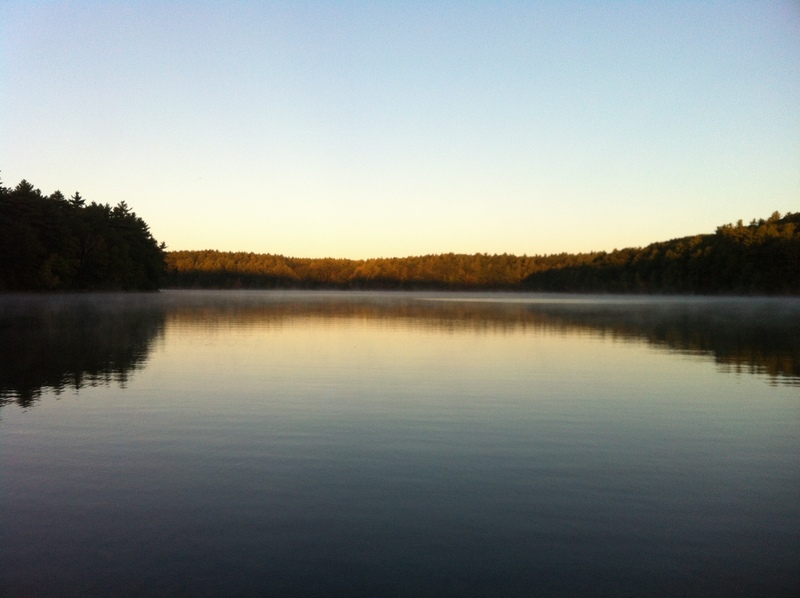 I have been swimming in Walden Pond a couple times a week since June. This morning was my last swim of the season. Sunrise is too late and I can no longer see my partner while we swim with the dark of morning like a blanket over the pond. But was so striking throughout the summer and early fall, was despite our swimming at the same time, same place, same direction, same distance, each swim was characteristically different: the plane of the water, the sky, the wildlife, the clouds, the moon, sun, stars, air. It was “wonder-full”.